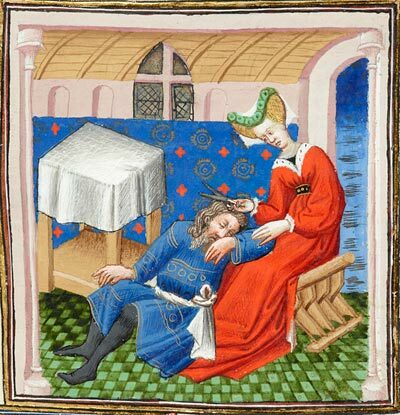 Delilah Shearing Samson's Hair (detail), by the workshop of the Boucicaut Master. Bible historiale; France, Paris, ca. 1415–20. Pierpont Morgan Library, MS M.394, f. 112 (detail). From section 3: "Luxury in a Time of Madness, 1390–1420." This exhibition will explore the evolution of fashionable clothing in Northern Europe—from the fashion revolution of the early fourteenth century to the dawn of the Renaissance. Drawn from the Morgan’s collections, over fifty illuminated medieval and Renaissance manuscripts and early printed books are featured. The nearly 200 years just prior to the Renaissance in Northern Europe constituted a fertile era for fashion, a period in which clothing styles changed rapidly, often from one decade to the next. The exhibition examines the role of social customs, cultural influences, and politics—such as the Hundred Years’ War, the occupation of Paris by the English, and the arrival of the Italian Renaissance—in shaping fashion. The exhibition also demonstrates the richness of symbolism in medieval art and how artists used clothing and costume as codes to help viewers interpret an image. In these works of art, what people wear is a clue to their identities and moral characters. To dramatize these fashions, four recreated ensembles replicating clothing depicted in the exhibition will be on view. The garments were made using period hand-sewing techniques and authentic materials—including silk velvet, gold brocade, linen, straw, and ermine. Orange houpeland (velvet) lined with fur (synthetic ermine) and with a belt (wool and silk), worn over a gold cote hardy (silk brocade), with hair in temples (silk, velvet, straw) with a veil (linen). Re-creation designed by Corinne Roes of Atelier Mette Maelwael, The Netherlands, after the Hours of Catherine of Cleves; Utrecht, The Netherlands, ca. 1440 (MS M.917, p. 65). 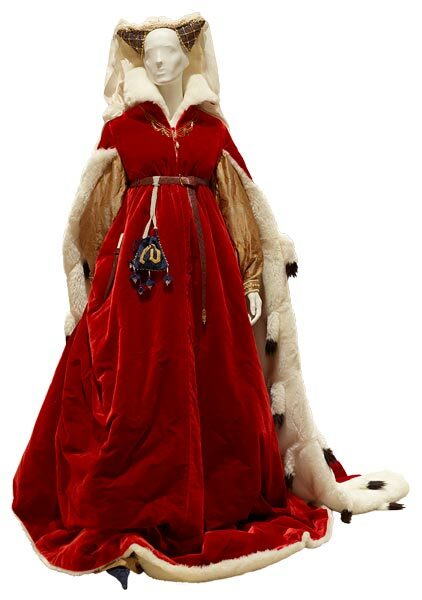 This entry was posted in Exhibition and tagged History of Costume, Morgan Library and Museum. Bookmark the permalink.